This is the second installment of a short series of posts coming from the study section of my Thompson Chain Reference Bible. The following "Seven Editions of Divine Law" come from pg. 1879. The following post is from Tim Challies' blog. Bruce was now some seventy-five years of age, his wife had been dead for several years and he was also ready for home. "I wonder why I am kept here so long," he would say to friends. The following year, while having breakfast, his daughter, Martha, was about to prepare him another egg when he said, "Hold, daughter, hold; my Master calleth me." He then asked that the house Bible, the Geneva Version, be brought. Unable himself to read it, he said, "Cast me up the 8th of Romans," and he began to recite much of the second half of the chapter until he came to the last two verses: "For I am persuaded that neither death, nor life, nor angels, nor principalities, nor powers, nor things present, nor things to come, nor height, nor depth, nor any other creature shall be able to separate us from the love of God, which is in Christ Jesus our Lord." "Set my finger on these words," he asked. "God be with you my children. I have breakfasted with you, and shall sup with my Lord Jesus this night. I die believing these words." Who won the Division II men's basketball championship this year? It took the last 0.1 second to decide. Anthony Atkinson's grandkids will be hearing about the last 45 seconds of this game...when he scored 10 points to win it all! For those with biblomarkaphobia, I'd like to recommend having a bible that you make a habit of marking, even if it's not your "main" bible. I'd suggest marking at least the Bible you use devotionally. I think you will find it to be a useful means of capturing your devotional insights in a concise, yet memorable, way. If you are already a Bible marker, perhaps you could benefit from the caution not to over-mark? You know the type, right? The can't-have-an-unmarked-page-or-else-someone-will-think-I'm-unspiritual-and-haven't-read-that-page-before marker guy/gal. We're crafty people when it comes to pride, and the dry fountain pen could be a sure sign of it. So, how do you decide what to mark? How do you decide how to mark what you mark? How are we to remember what our marks mean when we are reviewing, or expounding upon, our most-insightful mark(s)? For years, my favorite Bible has been the Thompson Chain Reference Bible (TCR) that my mom bought for me as a college student. The TCR Bible is built upon the premise that Scripture is the best interpreter of Scripture, and is replete with cross-references, study aids, and the like. It truly is a wonderful resource. This will largely depend upon personal taste and training. Generally speaking, it is better to select great themes and mark them consecutively through the Bible rather than mark many single verses on a wide variety of subjects. Whatever system is adopted or developed should be used sparingly and with careful thought. If the book is marked impulsively the pages may soon become a mass of confusing notations that will hinder rather than help study. Underlining or circling with a pencil the passages to be remembered or emphasized is the simplest method of marking verses. The Color Scheme. Colored pencils may be used to good advantage to emphasize great themes. Selecting the Colors. Choose colors purposefully rather than arbitrarily. For example: Red (the color of blood) may be used to mark passages referring to such subjects as the blood of Christ. Blue (sky color) is appropriate for marking heavenly themes. Purple (the royal color) for subjects related to kingship (or the Majesty of God). Green (evergreen) for subjects referring to future hopes. Yellow for marking golden promises. A drawing of an altar would represent sacrifice or consecration. Place the drawing on the margin opposite passages such as Abraham's sacrifice, Ge 22:6-14, or Paul's appeal for consecration, Ro 12:1. The Holy Spirit could be represented by wings of a dove. Mark a letter D over the wings by passages referring to the descent of the Spirit, such as Mt 3:16 and Ac 10:38. Mark an I over the wings where the Spirit is mentioned as indwelling. Mark a T over the wings where the Holy Spirit is teaching; and L where the Spirit is spoken of as leader. A drawing of a book would represent the Word of God. Suggestions of appropriate letters to write over the drawing of the book are: E for the enduring Word; I for the inspired Word; L for the Word loved; P for the power of the Word; S for the study of the Word. A cross can symbolize Jesus' sacrifice, and it may be marked with different letters to represent various aspects of the subject. A picture of a yoke opposite Mt 11:29 and similar passages would represent service. A sword would indicate warfare. A censer with incense rising would represent prayer. This symbol could be marked with different letters as follows: P for prayer prescribed; A for answered prayer; U for united prayer; S for secret prayer; I for intercessory prayer. A harp would represent praise. This brief list of symbols could be extended indefinitely. The value of symbols lies in the fact that they express important thoughts more strikingly and in much less space than words. This makes them especially appropriate for use on Bible margins. Anyone have a pencil that I may borrow? Lord willing from May 23-June 6 Nathan and I will be in Ethiopia teaching theology to a team of God-called, church-identified, elder-qualified, church-planting Ethiopian pastors who are hungry for biblical training. Oh yeah, and these pastors are exclusively planting churches among unreached Ethiopians. During our trip, I'm scheduled to teach two courses each day; Doctrine of Church, and Doctrine of Sin. Nathan will be teaching the Doctrine of Christ (he beat me to the sign-up schedule). 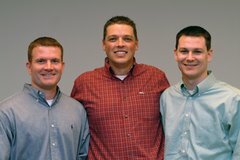 From April 16-26 (While Grace's Vision Team is in Nigeria), our friends Kurt and Scott from OH will be teaching the same group of men (Doctrine of God, History of Christianity, Christian Ethics). As of now, enough funding for 2 of the 72 pastors has come in. They are praying for the financial provision for the other 70 men to come in THIS WEEK. But that's no big deal. Actually it is not much more than skipping a few Big-Macs. Baptism this Sunday (March 25th) @ Union Avenue BC following lunch fellowship. Attempt to build a bridge into someone's life (co-worker, neighbor, etc) in hopes of eventually sharing the gospel with them. A suggested way to prepare your soul for Sunday's sermon (and service) would be praying through 1 Timothy 3. Ask God for a revival of biblical leaders in our day. Ask God to gift Grace with biblically qualified elders and deacons. Let's consider some of the prayers of the bible...together. In this ongoing series, we will post prayers recorded for us in Scripture, and interact with them...together. What do these prayers teach us about God? What do these prayers request from God? How should these prayers inform our praying? Well, that sets the stage. Our first biblical prayer is found in 1 Chronicles. Interact away! So David blessed the LORD in the sight of all the assembly; and David said, "Blessed are You, O LORD God of Israel our father, forever and ever Yours, O LORD, is the greatness and the power and the glory and the victory and the majesty, indeed everything that is in the heavens and the earth; Yours is the dominion, O LORD, and You exalt Yourself as head over all. Both riches and honor come from You, and You rule over all, and in Your hand is power and might; and it lies in Your hand to make great and to strengthen everyone. Now therefore, our God, we thank You, and praise Your glorious name. But who am I and who are my people that we should be able to offer as generously as this? For all things come from You, and from Your hand we have given You. For we are sojourners before You, and tenants, as all our fathers were; our days on the earth are like a shadow, and there is no hope. O LORD our God, all this abundance that we have provided to build You a house for Your holy name, it is from Your hand, and all is Yours. Since I know, O my God, that You try the heart and delight in uprightness, I, in the integrity of my heart, have willingly offered all these things; so now with joy I have seen Your people, who are present here, make their offerings willingly to You. O LORD, the God of Abraham, Isaac and Israel, our fathers, preserve this forever in the intentions of the heart of Your people, and direct their heart to You; and give to my son Solomon a perfect heart to keep Your commandments, Your testimonies and Your statutes, and to do them all, and to build the temple, for which I have made provision. Our friend Anthony highlights a teaching opportunity in Ethiopia. March Madness: Bryan, Nathan, Jordan, or... ??? Anyone who knows Bryan, Nathan, and I knows also that we are avid sports fans. And every sports fan knows that March Madness is the greatest sporting event in the world. So, as you've probably done also, we've filled out our brackets and await "One Shining Moment." As always, each pastor is convinced he'll win this year's bracket challenge. We would be curious to see which one of the three of us you all think will win...er, four...of us? (Tracy's in too, and in typical fashion has picked based on uniform color...and historically almost always wins!?) So, who will it be this year? FYI: Here's an ESPN article related to the NCAA tourney. The article features downtown Memphis' Rendezvous restaurant. Kenny was born and raised in Minneapolis. He came to know the saving grace of God in Christ during the summer of 1973, while a camper at a Bible camp. After high school graduation, he enrolled at Bethel College. At Bethel, he met his wife Kathy and was married in December 1979. He graduated with a double major in Psychology and Biblical/Theological Studies in 1981. One year after graduating from college, he entered Bethel Seminary. Led by the Lord to grow in the area of pastoral counseling/pastoral care, he increasingly focused on that area in his studies. He continues to be thankful to the Lord for the internship experience God gave him at Bethlehem. As an Apprentice in Bethlehem's program for seminary students, his internship was focused on pastoral care, pastoral counseling, pre-marital counseling, and marriage and family ministries. During seminary, he was selected to receive the Gordon Johnson Scholarship for Expository Preaching (which he declined). He graduated from Bethel Seminary with a Master of Divinity degree in 1988. In August 1988 the Lord called Kenny to Oak Hill Baptist Church in Humboldt, IA. After ten years preaching and pastoring in the local church, the Lord then called Kenny back to Bethlehem as Pastor for Urban Ministries in September 1998. Then, in March 2003, in response to the elder's growing sense the God was calling Bethlehem to develop an intentional church planting strategy, Kenny was appointed the Pastor for Church Planting and Strategic Mobilization. He currently is the Lead Pastor for Spreading, overseeing the outreach ministry departments at Bethlehem. Since 1979 Kenny and Kathy have been happily sustained by grace in their marriage and are the parents of four wonderful children: Michael, Elliot, Andrew, and Kathryn. Kenny plays the guitar, swims, and coaches baseball and soccer. Marc is married to Becky and has two children, Holly (12) and Connor (6). He works in sales full-time and is on staff 1/2 time in the worship department of Bethlehem Baptist Church. Marc enjoys reading, playing guitar, writing songs, spending time with his children (especially walking through the woods near his house), and going out (or staying in) with Becky. Thank you for the Word today. Jesus has ALL authority, therefore we shall obey Him. New Attitude Conference for young singles in Louisville. If interested, see sign-up sheet @ the resource table or speak with Kevin W.
Christian growth is evidenced by a greater love for Christ and His work for our salvation on the cross. The four points from Sibbes in this post frame this truth well. Again, remember this, that Christ rules us by a spirit of love, from a sense of his love, whereby his commandments are easy to us. The Marion small group at Grace Church walked through God's self-description in Nahum 1, this past Sunday. The Millington small group at Grace Church walked through God's self-description in Psalm 97, last night. The longer we conversed, the more clearly Christ appeared throughout these chapters. I encourage all to read the chapters, and perhaps those attending the small groups could even post some specific verses or phrases that point to the gospel. Praise be to God, Everlasting! Read this helpful synopsis of Matthew written by William Hendriksen entitled "The Beauty of Matthew's Gospel". See you Sunday! Note: The link to Hendriksen's article is now working. John Piper writes a must-read journal entry after his father died. I was radically embarrassed each time I "played" this "game." I suppose if I prayed more faithfully for the peoples of God's world I'd know my geography much better! My first score was a measly 42%?!!? For those like me who are always confused by the change, this means you lose an hour of sleep this weekend. Is on the sidebar just under our mug shot. Perhaps you would want to print this list and slowly chip away at finding the Scripture references to each one? Most importantly, meditate on the Triune Person of God as He has revealed Himself in the Scriptures. Enjoy! Friend of tax collectors and "sinners"
Where's Jordan been lately? I'd like to think I've been "enlarging my coast." More on that momentarily. Although I can think of few joys more enjoyable than the joy of expository exultation, these first two weeks of my current five-week stint out of the pulpit at Grace have, on several fronts, proven good for my soul. During these weeks I've intentionally limited my output, but I've managed to stay busy enough. I've often wondered how pastors did it all without being drained? Or worse, doing it all while being drained. And how much more effective they might be if they didn't have to wait until they were drained to take a much-needed sabbatical in order to seek the Lord's face? Not to take a break from the people, but for the people. To state the obvious, pastors (and all believers) should always be following the Lord and leading His people to nourishing pastures. But when a pastor is afforded a special season to feast upon the Lord apart from his weekly responsibility to feed the flock from the pulpit it is a double-good; first for his soul, and secondarily, for the people he leads. As he is refreshed, he is more usable in the Master's hand to feed and lead the people. I can only hope more pastors and congregations will enjoy this double-good. One significant blessing during this season has been hearing (and heeding) both of Nathan's sermons. May God heighten our knowledge of, and love for, our Good Shepherd, as well as our gladness to be built upon the foundation of Christ "For no man can lay a foundation other than the one which is laid, which is Jesus Christ." Another massive blessing, and certainly the greatest so far, has been 1 Chronicles. Pow. That's what the punch feels like when I read of the laborious preparations that were made by David for the building of the Lord's temple...even though the preparer never saw it happen! The prayer has become, "May God make GC willing to prepare - even for a lifetime - for the manifest nearness of God among His people in the Mid-South...even if we never experience it!" But, by all means, let us long to experience it during our lifetime, and pray expectantly. You don't need me to remind you that Jabez's prayer has gotten some serious mileage in recent years. You may have recognized my reference to it in the title to this post? 1 Chronicles 4:10-Now Jabez called on the God of Israel, saying, "Oh that You would bless me indeed and enlarge my border, and that Your hand might be with me, and that You would keep me from harm that it may not pain me!" And God granted him what he requested. The name-it-claim-it folk have claimed a nice mint on their exploitation of this verse. For that they will give an account before the Righteous Judge, and it will not be a fair meeting. I'm not happy with what prosperity preachers have done to make our efforts in downtown more difficult by duping the poor to believe their lack of faith is the root cause for their poverty. Its simply not true. The Son of Man was at times homeless. Well, back to Jabez. A marked difference wouldn't you say from contemporary applications of the same text? Perhaps SC will hear from me again before this five weeks is past. Either way, Lord, enlarge my coast! The following quote was emailed to me by my wonderful wife. I think she came across it on the girltalk blog. "Let us 'redeem the time.' Desultory working, fitful planning, irregular reading, ill-assorted hours, perfunctory or unpunctual execution of business, hurry and bustle, loitering and unreadiness,--these, and such like, are the things which take out the whole pith and power from life, which hinder holiness, and which cat like a canker into our moral being." We would be encouraged if an army of young Mid-Southerners were able to make it to this conference. This past week we focused primarily on God's attributes. We looked at 25 attributes of God, as described in His Word. This post is designed for groups to interact with other groups. So, post away with scripture, and application of scripture pertaining to what God is saying about Himself that is (currently) making deep impacts on your view of Him. It thrills me to know that this week there were 5; little, insignificant groups gathering across the mid-south to talk about and worship a gloriously infinite God! Father, may it be Your good pleasure to give us much grace in pursuing You! Read each of the passages on the attributes of God journaling thoughts and notes of how God is God. Repent of any views of God less than how He has described Himself in His Word. With Christ-like humility, worship the God of the Bible in every aspect of your life. Isaiah 57:15 For thus says the high and exalted One who lives forever, whose name is Holy,"I dwell on a high and holy place, And also with the contrite and lowly of spirit in order to revive the spirit of the lowly and to revive the heart of the contrite.